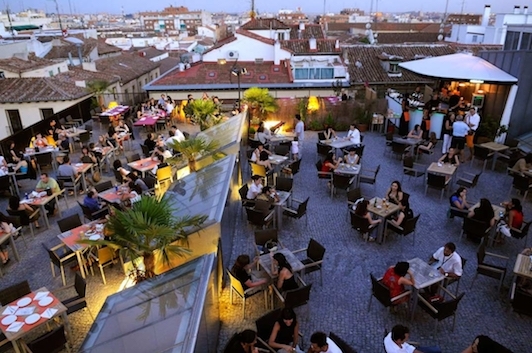 Rise to the rooftops and see Madrid from a different angle! A bustling city of urban terraces, panoramas and, stories that you'll only discover above ground. You'll be exposed to the positive social impacts that these elevated spaces have on the city. You’ll learn about some of the historical and dynamic spaces that shape the city while simultaneously supporting the local economy and businesses. • Participants: 2-15. The fare is based on the price for 5 people. The rate for groups smaller than 5 people is the same as the rate for 5 people. This tour will show you Madrid from a different perspective. You'll go through the southern part of the city center and see the parts of the city that tourists often miss. You'll learn about the historical and dynamic spaces that shape the city, while simultaneously supporting the local economy and businesses. Madrid is famous for its skies. Discover the city’s skyline and sunset from a bird eye’s view. Get away from the noise and chaos of ‘ground zero’ to take in some fresh air; and breathe in. Let us take you onto the buildings where you would only suspect an unremarkable façade or front door, but where we know an entire world hides behind, a world of terraces and panoramas. We open your eyes to a Spanish tapas bar on top of an ugly office building, for a relaxing sun terrace on top of a cultural center or a tasteful restaurant on top of a dull university library. You'll visit the rooftop of a cultural center that works in the areas of solidarity, culture, education and environment. You will also get to see the rooftop of a historical boys school left in ruin during the Civil War and which now houses the UNED (the long distance learning university). You'll learn about the important cultural heritage from the Industrial Period, and about Lavapiés, the multicultural neighborhood of Madrid. My fourth tour through Madrid (with a big group of 16 family members) it was amazing! Every spot covered with the history background. A truly surprising side of Madrid indeed! Surely not the same route I did before but tailor made on my request! Also Arma was a talented and enthusiastic guide! I can highly recommend this experience during your stay in Madrid! Madway organized a rooftop treasure hunt for our corporate team building. Sjouke did an excellent job of organizing, and Myrte was an enthusiastic and hugely appreciated facilitator. We really enjoyed the event, and considered it to be excellent value for money. In addition, Sjouke was extremely reactive to our emails and went the extra mile, helping us with lunch & dinner reservations. Thank you Madway, we loved the treasure hunt! This was an amazing trip! Saw really some nice things you otherwise shouldn't see... Special thanks to our guide Myrte! Myrte was nice and enthousiastic. She tells much about history and has lots of antidotes.